To evaluate the efficacy and safety using fibrin glue and absorbable hemostats for packing the endoscopic tract in a pediatric population in the prevention of subdural fluid collections after endoscopic third ventriculostomy. 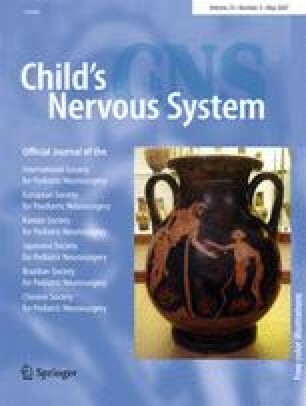 Twenty-one endoscopic third ventriculostomies were performed in 20 hydrocephalic children with a mean age of 22 months over a 4-year period using uniformly this technique. Six children, with age ranged 6 days to 22 months (mean 9 months), had severe ventriculomegaly with thin brain mantle less than 10 mm. There was no mortality and no permanent morbidity related to the endoscopic procedure. One child developed an asymptomatic collection, which could be managed conservatively and was most likely attributed to the young age of the child and the assumed poor cerebrospinal fluid absorption ability. Lost compliance of the brain parenchyma may play an additional role, which was not related to the thickness of the brain mantle. No adverse effects regarding the material used for sealing were observed over a mean follow-up of 23 months. Subdural fluid collections could be prevented in 20 out of 21 procedures by using this technique regardless of the thickness of the brain mantle, the application of mixture of fibrin glue and hemostatic agents seems to be safe, and we consider this technique effective in reducing the risk of this potential complication.